Spring / Summer 2012 announced a new collaboration between Bensimon and Eram. A collection of colorful shoes vitamin which is composed of Spartan and flat sandals, and sandals or high heels. At shopper now from 54.90 euros. In the collection Bensimon Eram, we love including the pair of flat sandals and leopard heels in beautiful summer colors green water. 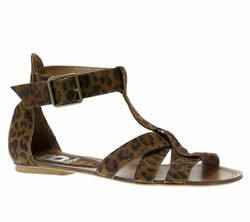 Spartans brown leopard print with wide straps (€ 54.90 – Also available in camel uni). High-heeled sandals sea green suede closed by a thin ankle strap, almond-toe heels and open way laminated timber 7 cm (€ 59.90 – Also available in beige, pink and yellow).